After three decades of hard work, Amtrak trains in the Northeast Corridor and Pennsylvania get to retire. 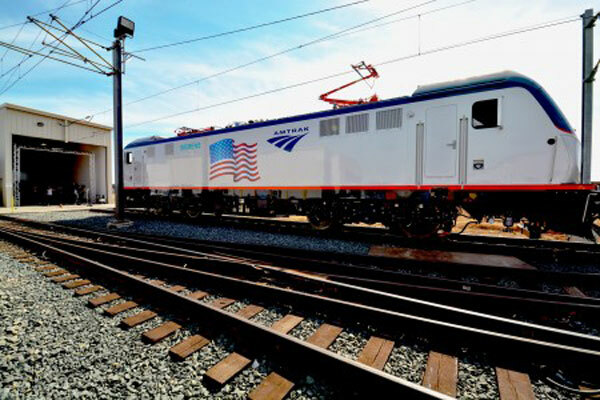 They will be replaced by 70 high-efficiency electric Amtrak Cities Sprinters (ACS-64) built by Siemens in Sacramento, California. The ACS-64 units are based on the company’s EuroSprinter, and the trains will take over for the Electro-Motive diesel locomotives made back in 1978 and 1988. The train overhaul is part of $466 million contract to purchase new rail equipment that was awarded back in 2010. As a part of Amtrak’s goal to replace all of the system’s cars and power plants over the next 30 years, the electric Siemens’ City Sprinters will help to bring the network up to speed. The trains are able to reach speeds of up to 125 mph on the Northeast Regional service between Boston and Washington D.C., and 110 mph on the Keystone Corridor that runs between Philadelphia and Harrisburg, Pennsylvania. Capable of accomplishing this while pulling 18 cars, the 8,600 hp trains also feature regenerative brakes that send 5MW of electricity back to the grid via the catenary. Amtrak estimates that the more efficient trains will save $300 million in costs over the next several decades. “The new Amtrak locomotives will help power the economic future of the Northeast region, provide more reliable and efficient service for passengers, and support the rebirth of rail manufacturing in America,” said Joseph Boardman, the president of Amtrak. Bringing a much-needed face lift to the most heavily traveled stretch of Amtrak trail, the country will begin to see long-awaited improvements to its transportation infrastructure. Train aficionados can follow their progress through Amtrak’s official blog. After three decades of hard work, Amtrak trains in the Northeast Corridor and Pennsylvania get to retire. They will be replaced by 70 high-efficiency electric Amtrak Cities Sprinters (ACS-64) built by Siemens in Sacramento, California. The ACS-64 units are based on the company's EuroSprinter, and the trains will take over for the Electro-Motive diesel locomotives made back in 1978 and 1988.